Avernum is a classic fantasy role-playing game, designed for anyone who longs for an epic quest, enjoys a fascinating tale, or misses the classic days of Ultima and Wizardry. It features beautiful 3-D, 16-bit graphics, 80 towns and dungeon levels, an enormous outdoors, and a fascinating storyline. 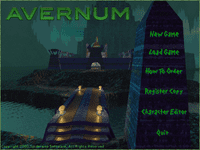 Avernum is from Spiderweb Software, makers of Nethergate and the award-winning Exile series.